Consider using the Demoya Collection to add a little extra light inside of your home. The white, pleated-shade encircles crystal droplets and beads. This pendant can be easily converted to a flush-mount for a versatile installation. The elegance meets modern to create this beautiful contemporary crystal and polished chrome flush mount. Mirrored ceiling platform inside blends brilliant reflections to enhance colour cast from crystals. This flush mount is part of a dazzling series that is sure to create wonderful accent lighting in your home. The circular metal mesh and brushed nickel shade combine to create the modern design of this 13 inch 2-Light Flushmount Light. Its distinct style features a mixture of metals for an industrial look that will compliment a home dicor featuring wood, brick, stone and other raw materials. The compact size is perfect for a foyer, hallway, kitchen, bedroom or den and the durable metal construction is built to last. Updating the lighting fixtures in your home is the most effective way to accomplish a striking, yet simple, Do It Yourself remodel. Tradition meets modern design with this attractive 13 inch 2-Light Flushmount Light featuring a dual fabric shade and brushed nickel hardware to create a warm and inviting fixture. The light gray satin inner shade emits a warm and soothing glow through the circular organza drum outer shade. Designed to work with almost any style home decor this light will add ambiance and charm to a foyer, hallway, bedroom or den. Updating the lighting fixtures in your home is the most effective way to accomplish a striking, yet simple, Do It Yourself remodel. A dazzling addition to any home, this 13 inch 3-Light Flushmount Light features a gorgeous metal cage and clear glass beaded shade with a dark bronze finish finial and mount. The traditional design and combination of materials creates a warm ambience that will work in a variety of home dicor styles. A decorative addition to your foyer, hallway, bedroom or den and made with durable metal construction which means this light is built to last. Updating the lighting fixtures in your home is the most effective way to accomplish a striking, yet simple, Do It Yourself remodel. 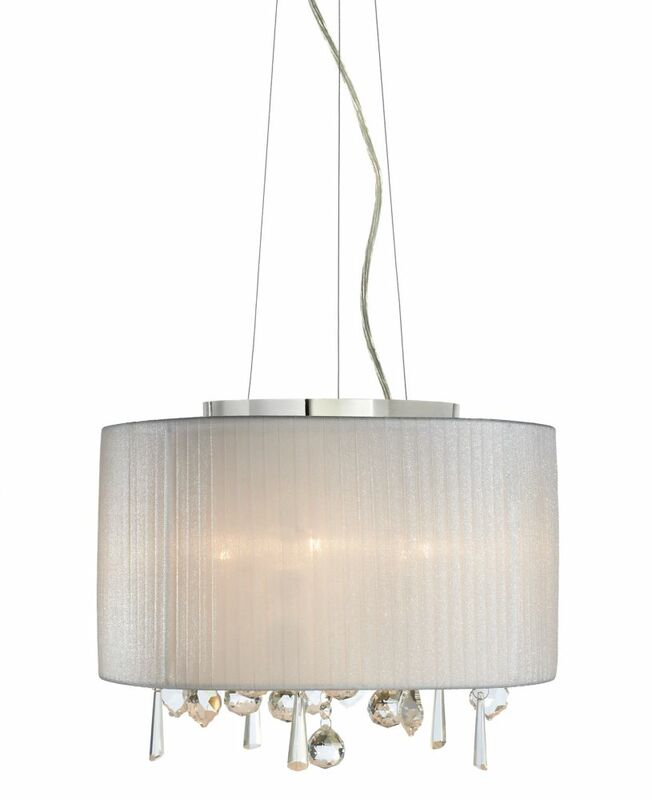 Demoya Collection 5-Light Chrome Convertible Pendant Flushmount Light w/ Crystal Droplets and Beads Consider using the Demoya Collection to add a little extra light inside of your home. The white, pleated-shade encircles crystal droplets and beads. This pendant can be easily converted to a flush-mount for a versatile installation.